When designing your Ecommerce product pages, the smallest differences can make a huge impact on the website’s overall conversion rate and profitability. Before we explore some specific ideas that you incorporate into your product page designs, I want to first introduce a framework I use for all conversion-based design testing. It’s a called the L.I.F.T model, which was developed by WiderFunnel. While reading through the ideas below, or considering other methods of improving your product pages, consider which of the six factors above it is focused on improving. 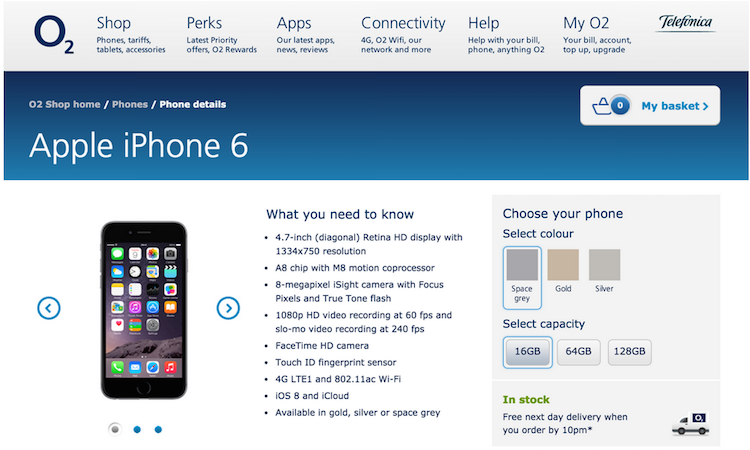 Many eCommerce sites make the mistake of displaying too much information on their product pages in one go. But what do you do when you’ve got a lot of information that the customer might need to know? The Watches of Switzerland website tackles this beautifully with a well-designed vertical tabbed navigation box. While you would need to A/B test this design against a ‘text heavy’ variation, it’s visually cleaner and represents a more intuitive way for the customer to find exactly what they’re looking for. If you sell high-ticket items on your eCommerce site, you might want to consider featuring various payment plans near to your call-to-actions. On the Sofaworks website, they offer three separate payment plans for customers looking to buy a new sofa. From monthly payments to ‘buy now pay later’, this helps the customer spread the cost of their purchase over several paychecks. According to iPerceptions, customers are 63% more likely to buy from a site that displays customer reviews. In a separate study, eMarketer found that customer reviews were trusted 12x more than manufacturer product descriptions. So, how should they be displayed? While I advise split testing the location, your customer reviews should be prominently displayed, and implemented in a way that uses rich snippet review markup. Rich snippet review markup will help your product pages be displayed more prominently in Google’s search results, increasing your click through rates, and traffic. By including customer reviews, you’ll also capture more long tail SEO traffic and traffic from users searching for ‘product name + reviews’ or ‘product name ratings’, which is likely to be extremely high quality converting traffic. But what about customers leaving negative reviews? A study by Reevoo found that the presence of bad reviews can actually increase a site’s conversions by 67%. How is that possible? 68% of users claimed to trust a website’s reviews more when they saw bad reviews as well as good reviews. 30% suspected censorship when only positive reviews were present. Needless to say, though, too many bad reviews is not a good thing. About two years ago, one of my sites ran a campaign where we offered a bundle of products worth $1,250 to musicians for $69 for 100 hours only. One of the products included was a 29 pack of music contracts. It turns out, thanks to live chat, that some of our customers thought they were actually buying a pack of 29 signed contracts ‘signing them’ to various labels etc. When we changed the landing page to say ‘music contract templates’, our conversion rate increased by several percent and customers were no longer confused. From experience, live chat is one of the simplest ways to improve a site’s conversion rate, not only because it provides a channel to solve customer’s objections, but also because it provides a constant stream of valuable ideas to improve your product pages. Generally speaking, the larger your product images, the higher your conversion rate will likely be. But what about going beyond large product images to include multi-angle images, 360-degree views, and videos? DueMaternity.com found that switching from two-dimensional ‘back and front’ images to 360-degree rotating images increased their conversion rate by 27%. In another experiment, online paintballing website Paintball-Online.com found that visitors who watched a product video were 26.36% more likely to convert. 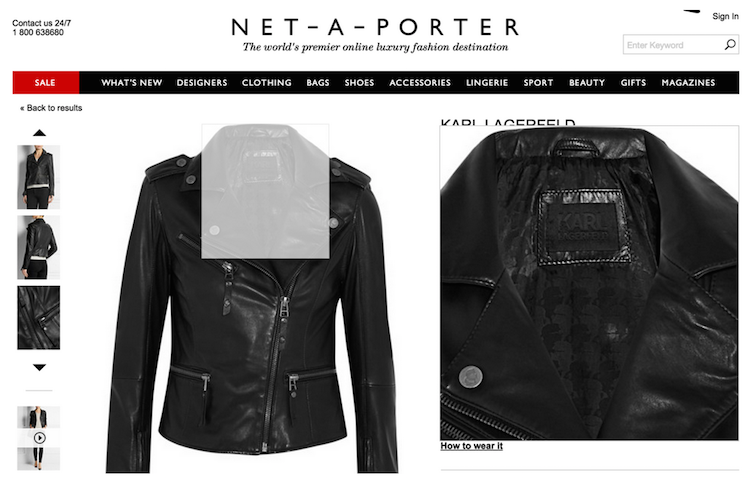 One of the most comprehensive examples of displaying multiple visual formats that I’ve come across is the Net-a-Porter website. As you can see, this particular product has it all; high-quality multi-angle images, hover-zoom, and product videos. As always, run the experiments to find what works best for you. In 2006, Amazon reported that for every 100 milliseconds they speed up their website, they see a 1% increase in revenue. My advice is this: build your site with functionality in the forefront of your mind, and page speed in the back of your mind. Once you have a functional product page template with all the features that are going to increase your conversion rate, strip out the fat and make it as lean as possible. 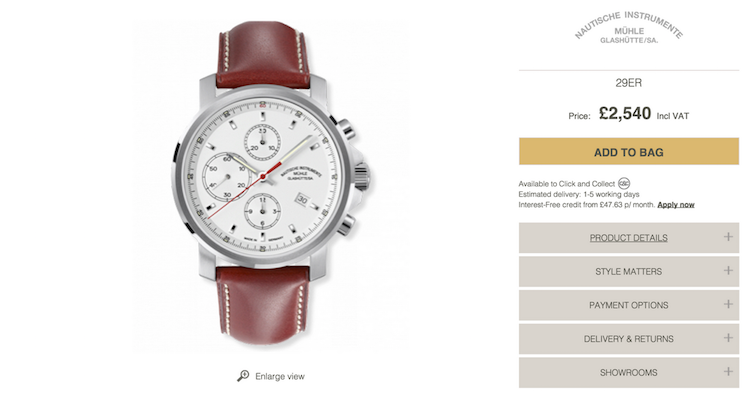 How fast should your product pages be? Ideally, under 2 seconds. However, out of ~15 major eCommerce stores in the UK that I tested, the average product page loading speed according to Pingdom was around 4 seconds. 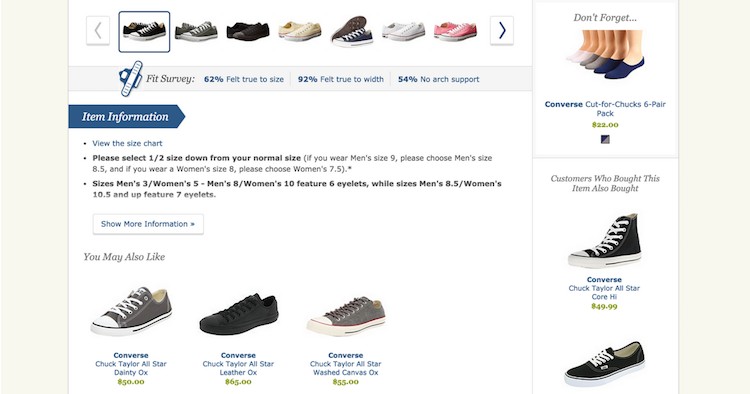 If your product page loading time is above two seconds, it’s probably influencing conversions. If you follow the tips in ‘How to Improve Your Page Load Speed by 70.39% in 45 Minutes’, you should be able to bring it down to a reasonable level. One of the easiest aspects of your product page to experiment with are your call-to-actions (CTAs). While there’s no such thing as a stylistic best practice, it’s important that your CTAs are clear, compelling, and contrast against other elements on the page. 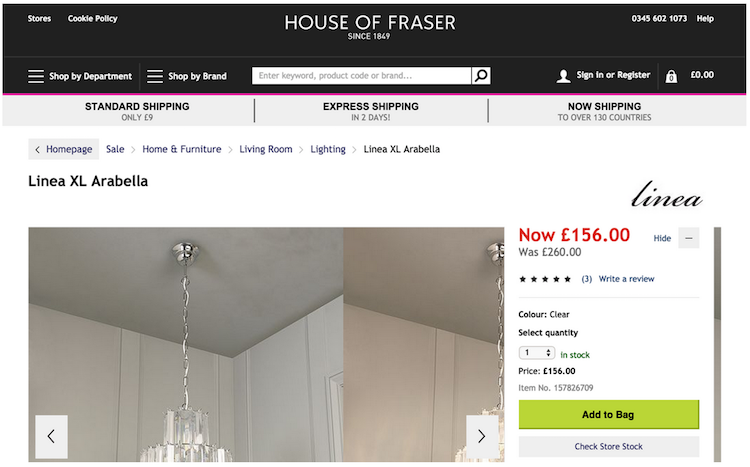 See the House of Fraser screenshot below for a good example of a bright and clear CTA. 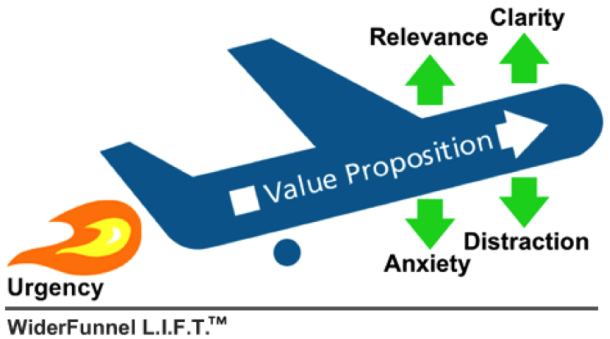 Remember the LIFT model I mentioned earlier? One of the six aspects to increase the likelihood of a desired action is to reduce anxiety. On your product pages, this can be achieved by combining trust signals and social proof to assure the customer that they’re in safe hands. Typical ways of doing this include displaying security badges, customer support phone numbers, customer reviews, and using an SSL certificate to display the secure badge in the browser’s URL bar. KitchenwareDirect do a great job of displaying all of this alongside their product’s call-to-actions. It’s been proven in both humans and monkeys that we’re irrational when it comes to loss aversion. Because we can’t stand missing out on things, urgency and scarcity are powerful tools in a marketer’s toolbox. When it comes to urgency and scarcity it’s important to note that there is a difference between real and implied urgency/scarcity. Real urgency, for example, is when you actually only have a limited amount of stock or time to sell a product. Implied urgency, however, is when you use phrasing like ‘hurry before they’re sold out’, to evoke the sense of urgency when there is no inherent urgency. Both are effective and can increase your conversions when used carefully. 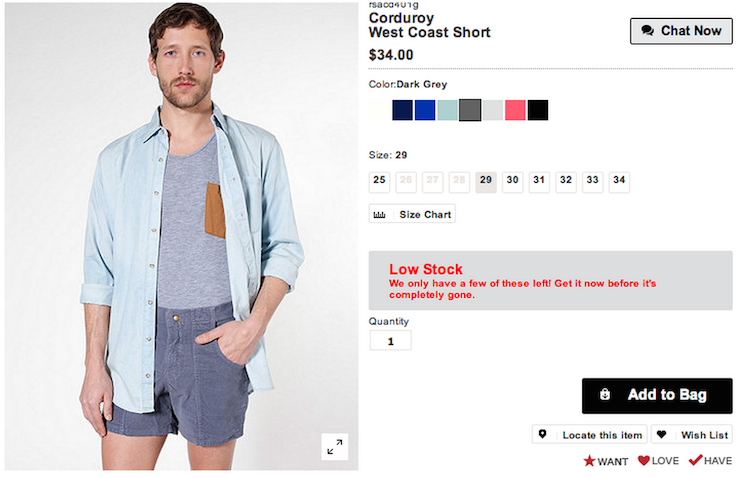 Below is a typical example of urgency being used on an American Apparel product page. The example below is even more interesting. While I would’ve recommended making the ‘only 3 in stock’ more prominent, it displays a good example of implied urgency by only offering free shipping for a certain amount of time. 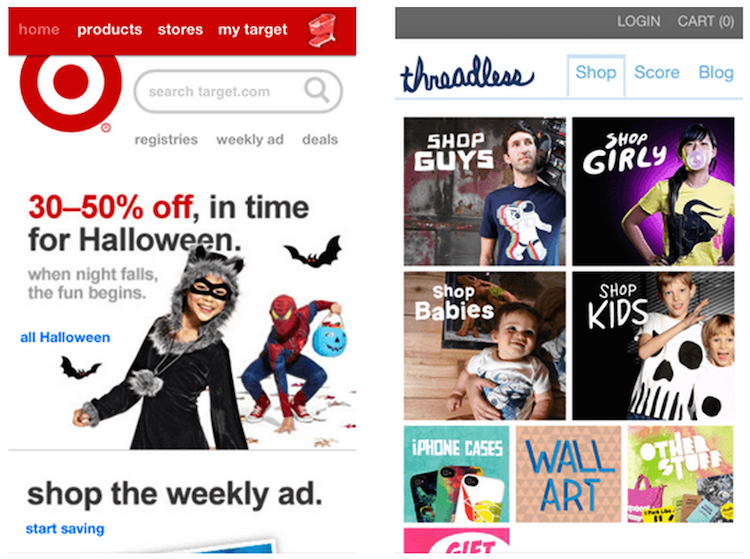 If you want to learn more about using real and implied urgency and scarcity on your website, I’ve written an in-depth post about it over on ConversionXL. When people are looking at your product pages, there’s a good chance that they haven’t made their mind up on which product they should buy. By displaying similar products, and products that other customers bought instead, you’re able to use your previous customer data to help shoppers find the products that might be a better fit for what they’re looking for. While Amazon is famous for doing a great job of recommending related products, I think Zappos do an even better job of displaying their recommendations in a user-friendly way. This is particularly important if your website sells products that are often used as gifts for special occasions, as many late shoppers will want peace of mind that their order will arrive in time. By displaying the estimated shipping time, you further reduce the ambiguity relating to what the customer should expect. By meeting or exceeding those expectations you can ensure that the customer has a great experience with your site. You might be wondering, how can we include everything outlined in this post without our design becoming overwhelming and clunky? This is where the skills of a talented designer come in. 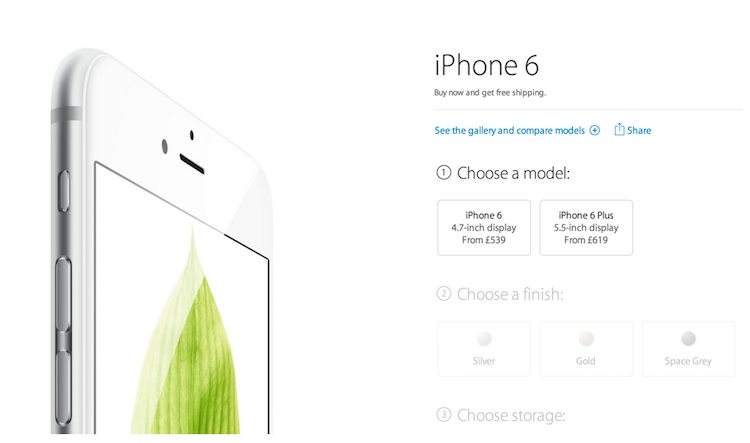 If you want proof that it can be done, just visit the Apple website. Their product pages incorporate huge amounts of information, comparisons, related products, images and photos. Yet, the overall experience is relaxing and easy on the eyes. In 2012, Google reported that mobile users were 67% more likely to buy from a site that had a mobile friendly design. Those numbers are likely very conservative now, given that responsive and mobile-optimised design is becoming increasingly popular. Test your product pages using Google’s mobile-friendliness tool. If your score is anything less than 100%, there’s a good chance that money is being left on the table. By displaying your refund or returns policy, you eliminate the ambiguity around the concern, as they’re reassured that the worst case scenario is that they have to send the item back. As always, it’s good to experiment with different ways of displaying this, but I recommend being as specific as possible. Vashi do this very well on their website, by displaying the exact date that you can return the item by, as well as explaining that they will refund your delivery and shipping costs as well. Another technique which, when done well, can have a great impact on your average order value is up selling products that compliment the product they’re looking at. Next do a great job of this on their clothing section. As you can see below, from the product page of their black dress, you can add a black and gold necklace to complete the look, adding an extra £12 to the transaction value. While we might have only covered the tip of the iceberg, I hope the fifteen examples above have given you some good ideas that you can experiment with and implement into your own eCommerce page designs. The important thing to remember with all of these tips and best practices is that what works for someone else might not work for your site, and vis versa. As I’ve reiterated multiple times throughout this post, nothing should be implemented without being tested against your current benchmark. If you have any other good tips or ideas worth sharing, please share them in the comments section below.